The Tax Man Cometh - CHARTER SCHOOL WATCHDOG http://www.charterschoolwatchdog. 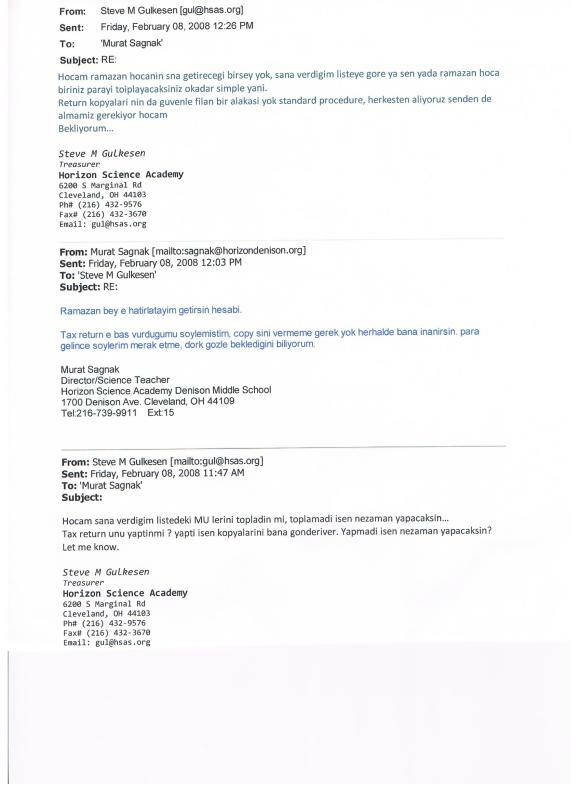 Here's an email to one of the Concept Schools managed charter school school accountants from the Midwest Gulenist head honcho enforcer Brother Veli. As part of the Hizmet contract for Gulenist employees, the Turkish employees are required to give back portions of their salaries as well as their income tax refunds, and in this instance, Brother Veli is unhappy with some of the guys who have failed to return their tax refunds. So not only do the H1-B visa guys and gals have to pay federal and state taxes on their " fake income," they then have to give back the difference in cash every payday to the business manager, (the money they get on paper and the money they are actually allowed to keep). And then to add final insult to injury, they have to give back their personal income tax refund when they receive it (those refunds also goes to the business manager). 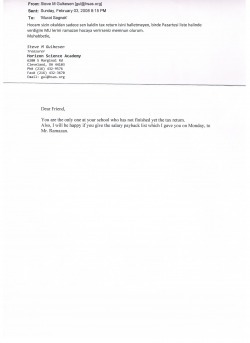 Tax season is a bonus for the Gulenists running American tax funded charter schools. 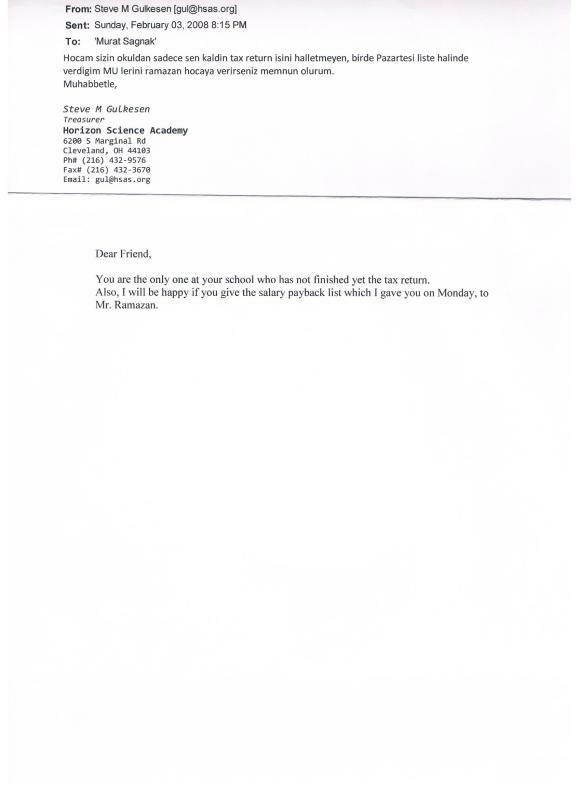 The Gulenists round up the Turkish employees and make certain that they (the Gulenists) are given copies of the schools' Hi-B visa employees expected tax returns and refunds. In the emails below, the average tax refund amount that Brother Veli is demanding is $310.00. That may seem insignificant until one calculates an average of 6 Turkish employees in 150 Gulenist managed US tax funded charter schools, and then the average cumulative figure jumps to a total of $279,000 being kicked back to the Gulenist operation annually, and since the schools have been in operation for about 15 years, that total jumps to $4,185,000.00. The cumulative figures are most likely lower than the actual amount, given that the Turkish school administrators have higher salaries than the Turkish teachers. 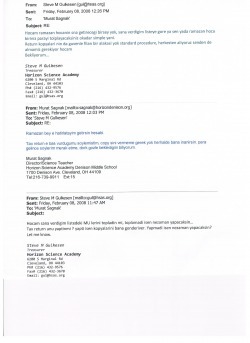 And check out the reference to "Brother Veli," who is the head honcho -- Midwest Regional Iman for Gulen, whom the Gulenists do not do anything without his consent. He's also the guy the "district" money collectors give the collective Tuzuk money to. 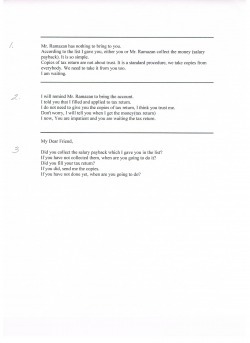 If you are confused as to why the Turkish employees are giving money to the business managers, read the contractual obligations in the Tuzuk blog (Turkish and English versions). (note: we recognize the spelling errors, but we are not going to correct/alter them and instead have published the emails as translated). Thank to the people who gave their tax return. I am sending to the attention of people who has not paid back yet. 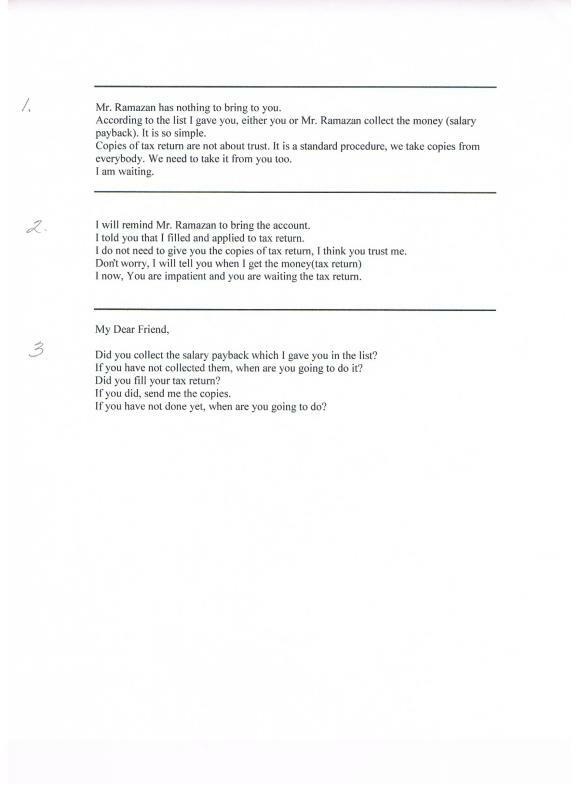 We still have to get money from the following friends. They did not pay their tax return yet. Can you get the money since this coming Friday? Also, As we talked on the phone, Veli Brother wants us to get the whole wage returns. If anyone does not want to pay, He told us to hold his/her paycheck. It is very important and very sensitive. Talk to the friends before direct depositing their check tomorrow. Maybe you need to write a regular check to the friends. Verenlerden ARO. Vermeyenlerin de dikkatine diye size de gondereyim dedim. Bu cumaaya kadarbu arkadaslardan alabilirmisin return u? Birde tel da konustugumuz gibi MU tam istiyor V abi. Vermeyenlerin cekinide turutun diyor. Mesele cok hassas, yarin direct deposit yapmadan arkadaslarla goruste ona gore regular checek kesmen gerekebilir. You got to love the references to "trust," it's kind of like "honor among thieves." This guy must be a rebel, he just will not give up his tax return. 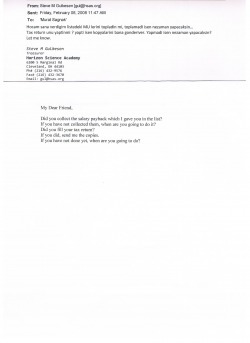 Did you note the reference to the "salary payback list?" See the "Tuzuk" page for a refresher in case you have forgotten. What's Up? You Haven't Paid Yet!